Dystopian comedy written by and starring Josie Long and Liam Williams. Siblings Josie and Liam live in a city divided by a giant, electrified fence. In the not-so-distant future, siblings Josie and Liam live in a city divided by a giant, electrified fence. The haves live on one side, the have-nots on the other. Josie and Liam live on the non-affluent side of the city and share a room - as in Josie lives in it for twelve hours a day and Liam for the other twelve; it is too small for two people to be in at one time. Then one day they're offered the opportunity to cross the fence and see how the other half lives. 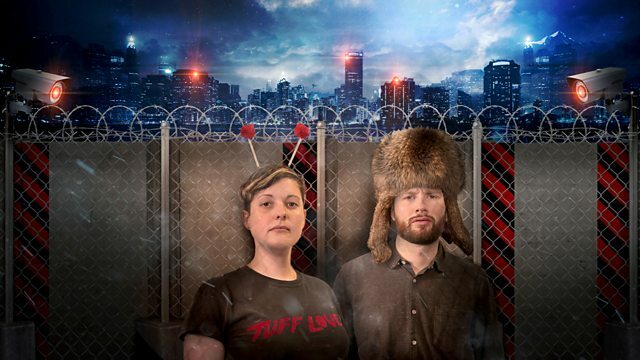 A dystopian comedy about an increasingly divided society written by and starring comedians Josie Long and Liam Williams. Josie is often described as a unique voice in comedy. She started stand-up at 14, winning the BBC New Comedy Award. She has appeared on: The News Quiz, Just A Minute, Never Mind the Buzzcocks, The Alternative Comedy Experience, Have I Got News For You and 8 out of 10 Cats, and is the voice of the Radio 4 show Short Cuts. Liam is a stand-up comedian, host of Invisible Dot's Stories night, and one-third of comedy sketch troupe Sheeps. He was shortlisted in 2013 for Best Newcomer at Edinburgh Festival, and his show 'Capitalism' was nominated for Foster's Best Comedy Show at Edinburgh last year. He's written and starred in his own series for Radio 4 (Liam Williams: Ladhood) and BBC 3 (Pls Like). Wow! Spaceships, alien soldiers, laser guns!